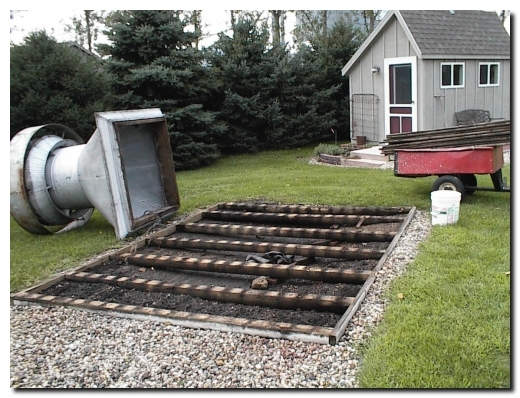 In the middle of August 2007 we had completed pouring concrete on the shop patio project but had leftover rock/sand mix that needed to be used or removed from the old machine shed floor that we were going to cover with topsoil. As you can see in the picture below, we had a sizable pile of mix left and we decided instead of moving it to a new location to set in a pile that we would use it up on another small concrete project we have planned. 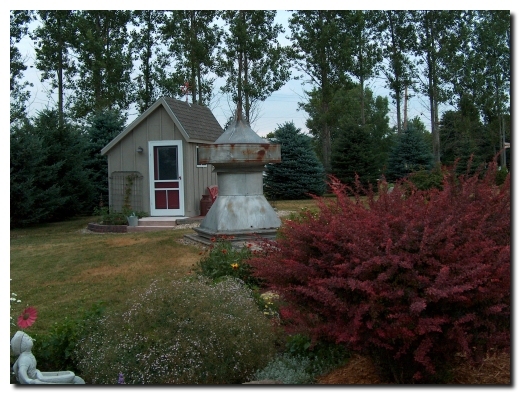 A year ago we purchased a barn top ventilator as a yard ornament but did not do anything with it beside set it on a wood deck that is located near Sandy’s Garden Shed. The deck was built when we developed the two original flower gardens as a way to hide a real eyesore. When we purchased the property we noticed a very unsightly “hump” in the yard north of the house and it turned out that previous tenants of the property had used this location as a trash fire area. When we tried to remove the burnt ashes and debris we discovered that the fire pile had been established over the top of a concrete slab of unknown age or use. 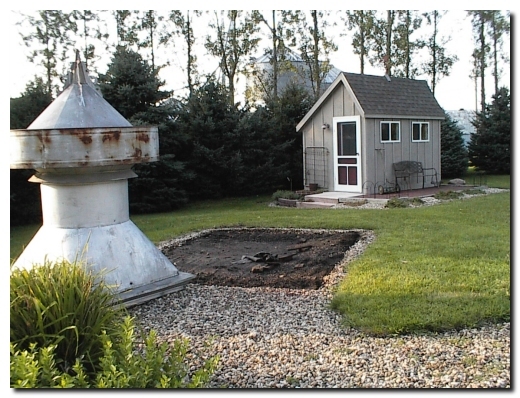 So with the need to get rid of some concrete mix we decided to remove the wood deck, pour some sidewalks to connect the garden shed to the garden area, and relocate the barn top ventilator onto a washed river rock area near where is has become a favorite feature of our yard. 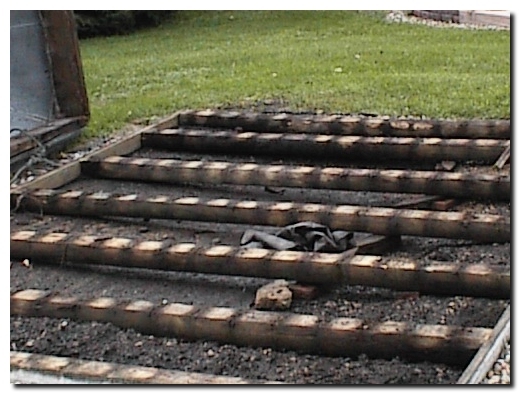 In the picture below you can see that I have removed the ventilator and then the 5/4 X 6” pressure treated decking. What remains are the landscape timbers that were the foundation for the deck. A closer look at the foundation reveals the old concrete foundation that has settled to the east and is partially covered with rock and gravel that held the deck from moving. The decking was in very good condition and I salvaged it for use on other projects. But the landscape timbers were pretty rotted, as were the 2 X 4 edge pieces. So these went to the trash. The deck, as you can see below, is removed and we have moved the ventilator onto the river rock area to prevent damage to it and to the lawn. The first sidewalk will cross this area so we will be moving it again. We had a bit of indecision on how to set the barn ventilator. 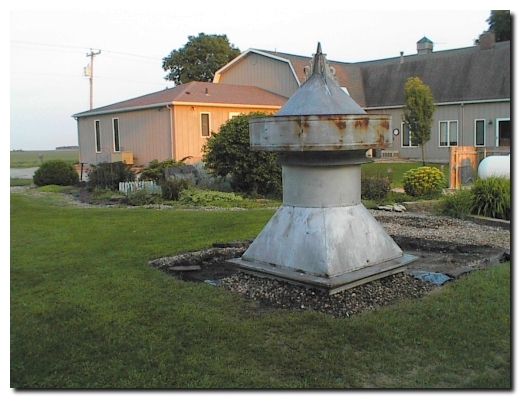 Our original plan was to pour a concrete pad or footing for it, but this would mean we’d need to trim the grass around it, so in the end we decided to set the ventilator on rock covered plastic. 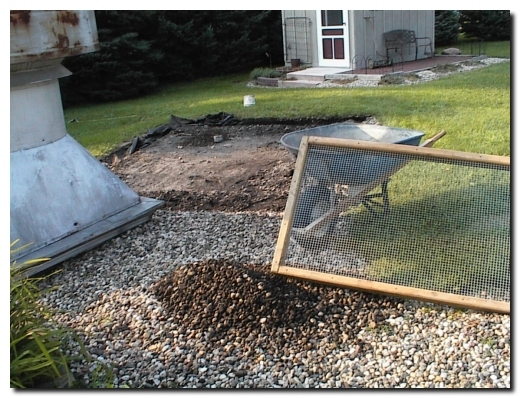 We had a rock moat around the old deck so removed it and the dirt that had settled into the rock over the years. I used the hardware cloth covered strainer I had made for this purpose. The ventilator came to use mounted on 2 X 8’s from the original roof framing. Since this material is not pressure treated I decided to add a base of pressure treated material that I salvaged from the deck we removed. I leveled the area where the ventilator was to set and then covered it with heavy black plastic. With a level base and the plastic to prevent weed growth it was time to set the ventilator. 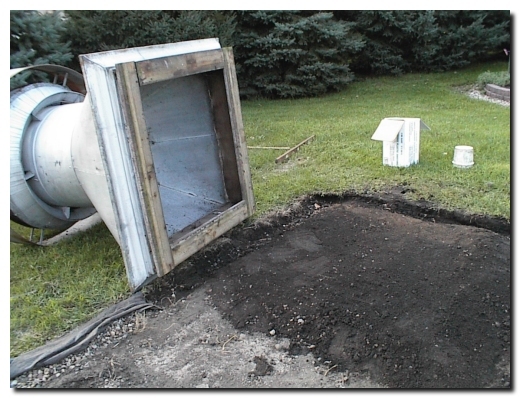 I used the salvaged rock I removed to complete the base on two sides of the ventilator. 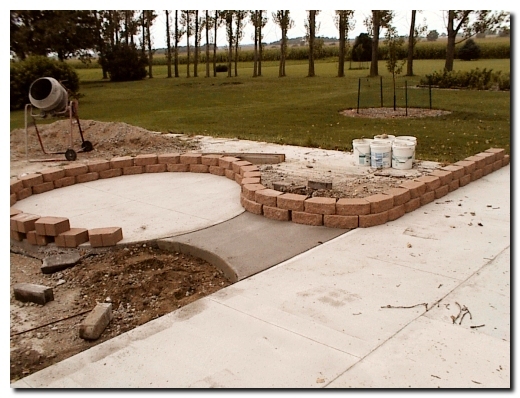 We will be pouring sidewalks near the other two sides so we will hold off on the rock until this is completed.